Dr. Alidadi strives to make treatment as gentle and effective as possible. She takes a conservative approach to dentistry, which means saving teeth whenever possible and helping her patients achieve excellent oral health. 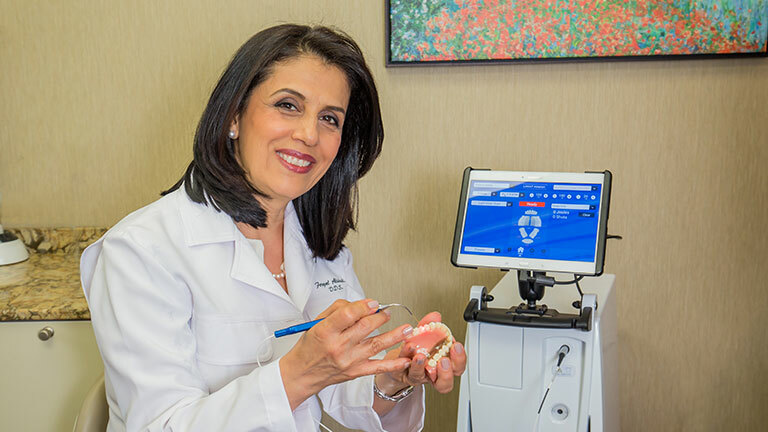 A key technology she uses to combat gum disease is the FDA-approved Laser-Assisted New Attachment Procedure (LANAP®). LANAP is a soft-tissue laser therapy that is used to remove diseased gum tissue. Dr. Alidadi uses LANAP to treat moderate to advanced gum disease. Compared to scalpel surgery, LANAP is a gentler and more effective manner of treating gum disease. This minimally invasive treatment targets only the diseased tissue, leaving the healthy gum tissue intact. The laser promotes healing by utilizing the body’s own ability to seal the healthy gum tissue back to the root of the tooth once the procedure is complete. LANAP therapy allows Dr. Alidadi to treat gum disease without having to cut, suture or remove tissue. This helps speed up healing and minimizes the risk of post-surgery discomfort or complications. LANAP has many advantages over scalpel surgery. It is much less traumatic and invasive as there is no cutting, stitching or bleeding. Dr. Alidadi recommends LANAP because it promotes healthy bone and gum tissue by encouraging the regrowth of the tissues and bone that have been lost to gum disease. Dr. Alidadi has also found that with LANAP treatment, there little to no risk of gum recession afterward. LANAP treatment is less time-consuming than traditional surgery. You can complete your treatment in two 2-hour visits or a single 4-hour session. Scalpel surgery requires four to eight appointments as well as additional appointments for suture removal and check-ups. Because LANAP is a less traumatic experience for patients, even those with health issues such as diabetes, HIV and hemophilia, as well as those taking blood-thinning medications, can receive LANAP. Patients receiving this treatment typically recover in less than 24 hours. Laser surgery has been found to provide long-lasting results. Studies have shown that 98% of patients who receive LANAP remain stable five years after their treatment. Dr. Alidadi will perform an oral exam to assess the extent of the gum disease and determine whether you’re a candidate for LANAP. She will take digital X-rays of your mouth to get an accurate picture of its condition. During the consultation you will have the chance to discuss concerns, have your your treatment options explained and get any questions answered. We also take the time to explain the procedure so you know what to expect on the day of your treatment. Dr. Alidadi uses a soft tissue laser to eradicate the diseased tissue and kill the bacteria beneath the gum line. The healthy gum is not harmed during the process. Next, Dr. Alidadi uses an ultrasonic scaler to remove tartar and calculus deposits that have formed beneath the gum line. The laser is then passed over the treated area a second time to remove any remaining bacteria and to stimulate the root, bone and surrounding gum tissue. This starts the clotting process. The blood helps to form a sticky seal around the pocket, which prevents new germs from entering the area and creates a sanitary environment so that the body can start the healing process. The procedure is fast and can be broken down into two 2-hour sessions or scheduled as a single 4-hour session. Most people can go back to work on the following day. “When I came to Dr. Alidadi, my gums were in really bad condition. I had swelling, pain and bleeding. Dr. Alidadi then recommended laser treatment. She had explained it was less invasive and had quicker healing time than normal gum surgery/treatment. “Initially I was reluctant but gave it a try.